800T 3 Position, Knob/Wing Lever,, White, Std. LIST PRICE: 119.90. Qualityis our top priority. Makes a great On / Off or isolator switch. Ideal for panel building or mounting in an adaptable box - 22mm cut-out. XB2-BD21 Two Position switch. We will always help you to have a 100% positive happy buying experience. 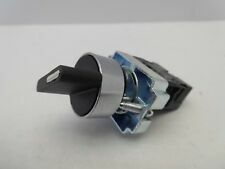 Selector Switch - New in Box. Code 3 Series A3 C030416. Item must arrive back in the condition it left in. Allen-Bradley 800T-J2KC1 Selector Switch, 3-Pos. Maintained, New In Sealed Box. Condition is New. Shipped with USPS Priority Mail. SP3T OFF-ON-ON. 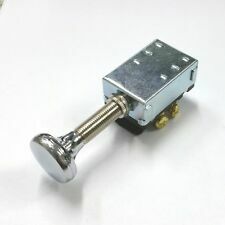 This PUSH/PULL Switch has 3 Positions: OFF at Rest (pushed all the way in) ~ ON at the Mid Position ~ ON When Fully Extended (pulled all the way out). 3/8" (0.375") Round Hole Mounting, Panel Thickness up to 1.0". NEW ALLEN BRADLEY 800T-J2A 3 POSITION MAINTAINED SELECTOR SWITCH. Condition is New. Shipped with USPS First Class Package. Greenwood Airvac; GS2 (2-position switch). The GS2 is a switch designed to enable the user to manually select the desired ventilation systems flow rate. GS2 Remote Switch Positions Function. Trickle (I) Fan running at trickle speed. NEW EATON SWITCH. PART NUMBER 10250T3043. 60 DEGREE THROW. THROW; LEFT-CENTER-RIGHT 60 DEGREE. LEVER TYPE. 3 POSITION. HEAVY DUTY. FREE Trial ! The selector switch is new never used in the original box. Model # : C-2000 P9MSLZ5V. Illuminated 3-Position Selector Switch. Sustained Left. Office Hours If you do not have an account No Worries! SKU# SB-087747. Model: 49SASB3. Selector Switch Kit. New in Box. Horizontal Type. 1 x Switch. Quantity: 1Pc. Color: As the picture shows. YOU will receive. YC-SS22XPMA-3 HOA 2NO 3Position Maintain Selector Switch. IEC 947 CERTIFIED. PART / MODEL / STYLE NUMBER: ZB4BG4. SCHNEIDER ELECTRIC. KEYED SELECTOR SWITCHES. 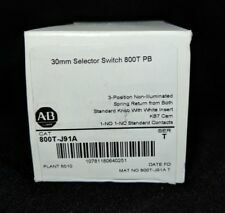 ALLEN BRADLEY 3 POSITION SELECTOR SWITCH 800T-J2A. Series T. NEMA TYPE 4,13. New in the original box. Part Number: OT2S1. Manufactured in the U.S.A by Westinghouse. Rugged electrical power selector switch. 2 Position Cam. Local pickup can be arranged. Quantity Available: 2. Allen Bradley Illuminated Selector Switch. 3 Position Selector Switch. This item has been described to the best of our ability. Item(s) are NEW in Box - As Pictured - Opened box for photos. 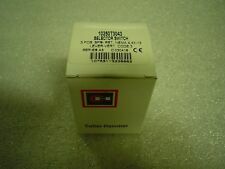 Allen-Bradley 800T-10JRH2KB7AX Illuminated Selector Switch, Type 4,13, 3 Position, 120V, Red Knob. New in box. What you see in pictures is what you will received. Below are a few details about this item Manufacture: Rockwell Automation. Standard black knob w/ white insert. Part # : 800T-J4A.